Part of the strategy for generating rapid-response ground motion maps is to determine the best format for reliable presentation of the maps given the diverse audience, which includes scientists, businesses, emergency response agencies, media, and the general public. In an effort to simplify and maximize the flow of information to the public, we have developed a means of generating not only peak ground acceleration and velocity maps, but also an instrumentally-derived, estimated Modified Mercalli Intensity map. This map makes it easier to relate the recorded ground motions to the expected felt and damage distribution. The Instrumental Intensity map is based on a combined regression of recorded peak acceleration and velocity amplitudes. With the 79 Malaysian Meteorological Department seismic station distribution, data gaps are common, particularly for smaller events and events near or outside the edge of the network. In order to stabilize contouring and minimize the misrepresentation of the ground motion pattern due to data gaps, we augment the data with predicted values in areas without data. Given the epicenter and magnitude, peak motion amplitudes in spare regions are estimated from the Joyner, Boore, and Fumal (1997), and Joyner and Boore (1988) attenuation curves. As the real-time detection with current seismic station density increases, this difficulty should be alleviated. Small open circles represent "phantom" grid stations where strong motion values were estimated. The instrumental intensity map does not show station symbols and does not have the popup information window. The legend bar at the bottom explains the colors. ShakeMaps are computed as the uncertainty-weighted combination of ground motion amplitudes from a Ground Motion Prediction Equation (GMPE), seismic data, and (optionally) reports of macroseismic intensity. This weighted-averaging process allows us to compute an uncertainty at each grid point in a ShakeMap. Since the GMPE also provides an estimate of ground motion uncertainty at each point, we can compute the ratio of the final ShakeMap uncertainty to the GMPE uncertainty. This ratio lets us know at each grid point if the ShakeMap is more or less uncertain than a purely predictive map generated by the GMPE. We utilize the uncertainty ratio to produce a graded map of uncertainty. Where the ratio is 1.0 (meaning the ShakeMap is purely predictive), the map is colored white. Where the ratio is greater than 1.0 (meaning that the ShakeMap uncertainty is high because of unknown fault geometry) the map shades toward dark red, and where the uncertainty is less than 1.0 (because the presence of data decreases the uncertainty) the map shades toward dark blue. These maps provide a quick visual summary of quality of the ground motion estimates over the area of interest. ShakeMaps are also given a letter grade, based on the mean uncertainty ratio within the area of the MMI 6 contour (on the theory that this is the area most important to accurately represent). A ratio of 1.0 is given a grade of "C." Maps with mean ratios greater than 1.0 get grades of "D" or "F." Ratios less than 1.0 earn grades of "B" or "A." If the map does not contain areas of MMI >= 6, no grade is assigned. 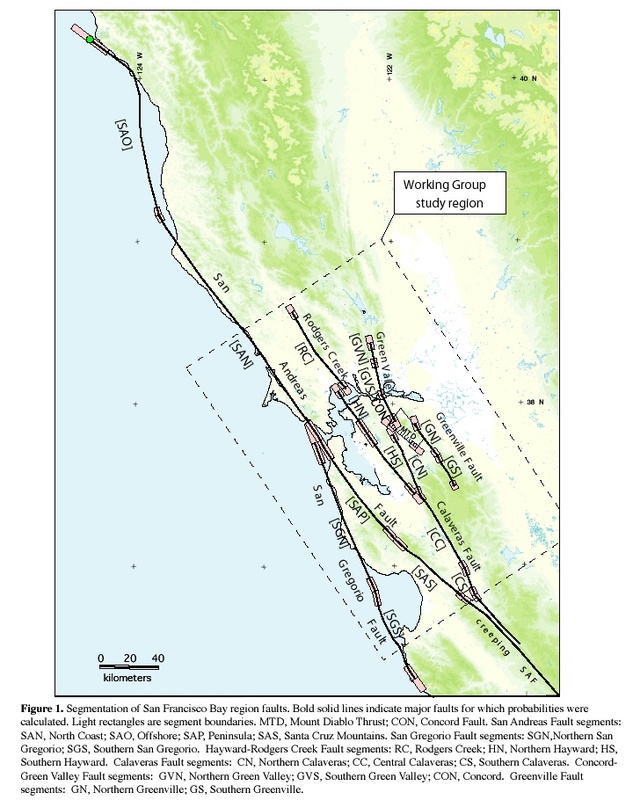 The Working Group allowed for the possibility of either single segment or multi-segment earthquakes on the seven fault systems. Each possible combination of segments was called a rupture source and each rupture source represents a possible future ”scenario” earthquake. WG02 assigned weights to the likelihood of occurrence of all combinations of the possible rupture sources for each fault system. The resulting rupture sources—34 in all—along with their mean magnitude, probability of occurring in the next 30 years, and the associated uncertainities in the probabilities are listed in Table 1. In California, the California Geological Survey (CGS) and the U.S. Geological Survey (USGS) have evaluated the probabilistic hazard from active faults in the state as part of the Probabilistic Seismic Hazard Assessment For The State of California described by Peterson et al. (1996) and the National Seismic Hazard Mapping Project described by Frankel et al. (1996). From these maps it is possible to prioritize the best scenario earthquakes to be used in planning exercises by considering the most likely candidate earthquake fault first, followed by the next likely, and so on. Such an analysis is easily accomplished by hazard deaggregation, in which the contributions of individual earthquakes to the total seismic hazard their probability of occurrence and the severity of the ground motions are ranked in order. U sing the individual components ("deaggregations") of these hazard maps, a user can properly select the appropriate scenarios given their location, regional extent, and specific planning requirements. Currently, the ShakeMap scenario events come directly out of the CGS catalog of fault source parameters that make up the statewide probabilistic seismic hazard assessment. Users interested in specific scenarios for planning purposes are encouraged to make such a request to MetMalaysia. II Gegaran dirasakan oleh beberapa orang sahaja yang berada dalam keadaan pegun terutama di tingkat atas bangunan tinggi. Objek-objek ringan yang bergantungan akan bergoyang atau berayun. III Gegaran dirasai nyata di dalam rumah atau bangunan tetapi tidak disedari sebagai getaran gempa bumi. Getaran seperti seolah-olah sebuah trak ringan bergerak dan jangka masa getaran boleh dianggarkan. IV Gegaran dirasakan oleh ramai orang pada waktu siang dan malam, gegaran boleh menyebabkan beberapa orang terbangun. Tingkap, pinggan mangkuk, pintu bergetar dan kaca berdenting. Dinding kayu dan rangka bangunan berbunyi. Getaran seperti seolah-olah sebuah trak berat menghentam dinding. V Gegaran dirasakan oleh hampir semua penduduk. Orang yang tidur terjaga. Objek-objek yang tidak stabil berubah tempat. Pintu berayun, terbuka dan tertutup. Bidai, bingkai gambar dan pokok bergoyang. VI Gegaran dirasakan oleh semua penduduk. Kebanyakan orang terkejut dan berlari ke luar bangunan. Berjalan dalam keadaan tidak stabil. Perabut bergerak dan berubah tempat, siling dan dinding retak. Kerosakan ringan berlaku. VII Semua orang keluar dari rumah. Kerosakan ringan pada rumah dan bangunan yang dibina dengan struktur yang baik tetapi pada bangunan dengan struktur yang kurang baik terjadi keretakan. Dirasai oleh orang yang menaiki kenderaan. VIII Kerosakan ringan pada bangunan yang mempunyai struktur yang kuat. Keretakan pada bangunan yang mempunyai struktur kurang baik. Dinding panel yang terkeluar dari struktur rangka. Serombong dan monumen-monumen roboh. Air perigi atau kolam menjadi keruh. Orang yang menaiki kenderaan terganggu. IX Kerosakan pada bangunan yang berstruktur kuat, rangka-rangka rumah menjadi tidak lurus dan banyak yang retak. Bangunan dan rumah berganjak dari lokasinya. Paip-paip bawah tanah pecah. X Kerosakan pada bangunan yang berstruktur kayu, rangka bangunan dan rumah musnah, terjadi rekahan dalam tanah, rel-rel di landasan rosak, tanah runtuh di kawasan yang curam dan berdekatan sungai. Joyner, W. B. and Boore, D. M. (1988). Measurement, characterization, and prediction of strong ground motions, in Proc. Conf. on Earthq. Eng. & Soil Dyn. II,Geotechnical vision, Am. Soc. Civil Eng., Park City, Utah, 43-102. All of the information present above is originated from USGS ShakeMap Team and their respective owner.